Sofrito is a basic tomato sauce that is made all over Spain. It's easy to put together—simply sauté tomatoes, onions, garlic, and green peppers in olive oil in a frying pan. The gentle cooking mellows the acidity of the tomatoes and creates a perfect blend of flavor that is versatile and adaptable. Sofrito is often the foundation of many Spanish recipes. It is sometimes mixed into rice or scrambled eggs, and although it is delicious on its own, the sauce isn't really used as a condiment. It is more common for it to be incorporated as an ingredient in other dishes, such as the filling for ​empanadas. As with all traditional recipes, there are hundreds of versions of sofrito sauce. The amount of garlic, pepper, and spices can be adjusted according to the chef's taste. This one is a family recipe from Avila, Spain. Cut the pepper into 1/4-inch (or smaller) pieces. Heat a large frying pan with a heavy bottom over medium heat. Pour in enough olive oil to coat the bottom of the pan. Put the onions into the pan and sauté them until they are transparent, reducing the heat if necessary to avoid burning them. Add the green pepper and continue to cook for 5 minutes, adding olive oil if necessary. Be sure to stir often, so the vegetables do not burn. Add the minced garlic and sauté for 1 more minute. Add the crushed tomatoes and paprika to the pan and mix well. Continue to cook for about 10 to 15 minutes, reducing the liquid released from the tomatoes until a somewhat thick sauce is achieved. Serve as desired and enjoy! If you are using the sofrito as an ingredient in another recipe, allow it to cool for a few minutes before adding it to your dish. Warm sofrito is preferred if you are serving it as a sauce with fried eggs or rice. Tomato sauce mellows and becomes sweeter overnight, so many Spanish cooks like to make a double recipe and use it throughout the week. It will keep in the refrigerator for five days in a well-sealed container or jar. You can also store that double batch of sofrito in the freezer and save it for future uses. Be sure to let it cool completely, then divide it into plastic freezer bags. It will last up to six months. 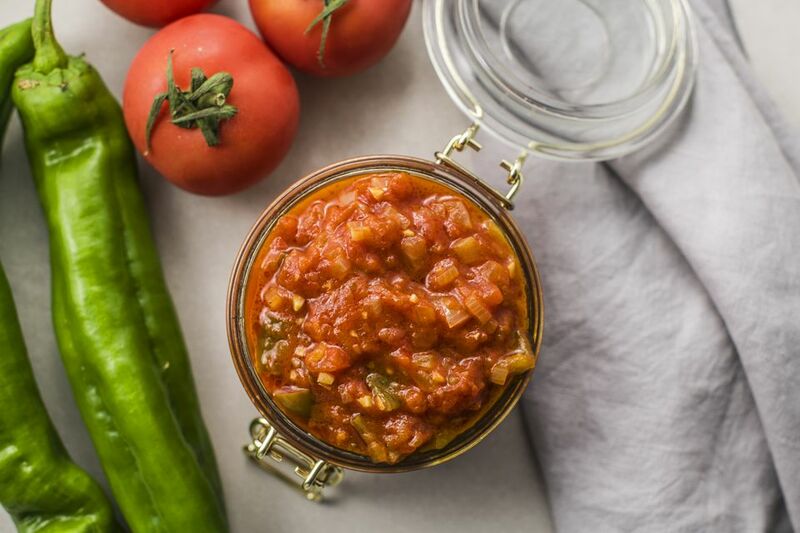 Because the flavors of sofrito complement many foods, there are numerous recipes that include the traditional Spanish tomato-based sauce. Spanish chicken with sofrito is a simple dish to put together but tastes like you spent hours—and many ingredients—making it. Boneless chicken is pan-fried, sliced, and then simmered in the sofrito (which, if you have pre-made, makes this the perfect dish for a quick weeknight meal). For something a bit out of the ordinary, try Spanish rabbit in sofrito, which requires a similar preparation to the chicken dish with the addition of white wine and herbs. Crayfish, which are popular in Spain and look like a miniature lobster, also combine beautifully with sofrito, making for somewhat of a simple shellfish stew. Bacalao con tomate is another Spanish dish including sofrito, this time featuring codfish. A basic sofrito is always welcome spooned over a fried egg. You can also add some heft with additional vegetables and spices, such as mushrooms and hot sauce, and toss with pasta or mix into rice for a side dish or vegetarian entree. As with many Spanish dishes and sauces, sofrito has been incorporated into many other cuisines, including Cuban, Puerto Rican, and Dominican. Spain's global colonization throughout history took the sauce not just to Latin America, however, but also the Philippines, and many other places around the world. It is very common in Caribbean food and each island puts its own spin on sofrito. You can even see sofrito's influence in French and Italian sauces.